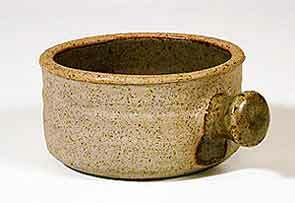 Pearson pan - 3½" (88 mm) diameter. Colin Pearson is best known for his wing design which he used for vases in a variety of styles. He was born in London in 1923 and studied at Goldsmith's College. He worked at Winchcombe before going to Lambeth in 1954 to work at the Royal Doulton Pottery. The turning point of his career was in 1955 when he took over the running of Aylesford Pottery from David Leach who had set it up a year earlier at the Carmelite Friary in Aylesford, Kent. Leach left to set up Lowerdown Pottery in Devon, and Pearson took over as manager of Aylesford Pottery. In 1961 he set up his own workshop, Quay Pottery, making domestic wares a hundred yards down the road from the Priory in Aylesford village. After about ten years, Colin Pearson stopped making his domestic pottery to spend more time on individual pieces. He carried on at the Quay Pottery for a further ten years, during which time he taught at the Camberwell School of Art and the Medway School of Art, and then moved to Islington, London.